Posted by Tomboktu in 1970s), Civil Rights, Film and Television, History, LGBT Rights. …before tour with Cult and Mission……so presuming he returns to the Killing Joke fold what could be more appropriate than this from their classic eponymous 1980 album? TBH was a bit surprised by that line up of groups for a tour. Posted by WorldbyStorm in Economy, Irish History, The Left. I’ve been reading an interesting book recently on the wartime bombing of Dublin in May 1941. By Kevin C. Kearns, an US historian who has written a series of books on Dublin, it’s entitled The Bombing of Dublin’s North Strand, 1941. In comparison to the conflict globally this may have seemed like a small event, four bombs (one of which was a massively explosive landmine designed to inflict maximum damage) were dropped across an hour or so. One fell in Phoenix Park, the other three off North Circular Road and on the west side of North Strand. 40 people or more (numbers remain imprecise) were killed by the bombs, an hundred more were very seriously injured and many many more were less seriously injured. The motivation for the bombing remains uncertain, an accident or some sort of effort to send a message to the Irish government (particularly in the wake of assistance to Belfast after the bombing there earlier that year? Certainly the evidence can be argued either way, though I guess on balance I’d tend to the accident theory (that said there’s curious evidence that the bomber pilot flew repeatedly over the scene at low level as if looking for something and the fact it was so limited a bombing is odd too). It’s a fascinating book which covers the ground forensically and builds into a real picture of life in the city during that period and that Whit weekend. It’s also filled with photographs of the aftermath of the event. But one fascinating chapter engages with the issue of those who were left homeless by the bombings, many of whom were rehoused in Cabra which at that time was considered a part of the country by inner city residents. Their plight is unfortunately – having read Conor’s Sins of the Father – much less a surprise than it might have been. Families and individuals were quite literally abandoned to new houses that had been built too quickly (so that when fires were lit chimney breasts cracked) with only blankets. The rents on the new properties were often double the rents they used to pay to the Corporation. And there’s one telling anecdote which in some respects is an example of the attitude that has persisted well into the contemporary era in relation to such matters. Some new inhabitants [in Cabra] were left virtually helpless. Nan Davis tells of the hardship of two widow friends, Ginny and her sister Rosie. The bombing had rendered them essentially destitute. A 1975 documentary about Shelbourne FC, which was first broadcast in the run-up to the team playing Home Farm in the Final of the FAI Cup. Was broadcast again recently on RTE as part of the TV50 series. On April 21 1975, the veteran Shelbourne Football Club faced new comers Home Farm in a do-or-die Cup final. Shelbourne lost 1.0. Earlier that week, Shelbourne had featured in a ‘no holds barred’ documentary made by Brian MacLochlainn called ‘In my book you should be ahead!’ which captured the depth and passion of this clubs commitment to soccer and to its great tradition as a local team. Shelbourne Rovers was founded in 1888 and had many years at the top of the soccer world in Ireland. We meet the team when its fortunes are low. Indeed, this era sees the beginning of a slide which only came to an end in 1992 when Shelbourne won the FAI Championship. In the words of Con Houlihan who wrote the publicity article for the programme in the RTE Guide 1975: ‘Shelburne Football Club were for generations as taken for granted as the tides; now in a world of cumulative change their existence is insecure. They are without a ground of their own; their following is small; they are low in the League. But footballers have a strange mad pride that makes misfortune seem irrelevant –Shelbourne’s displays this season have lacked nothing in spirit. Brian MacLochlainn has made a film about this club and among its many effects is the dispelling of the myth that Irish soccer is dying. The electronic eye and ear take you into a world where players are more than numbers in permutations. You see how playing affect their lives; you see how deeply defeat depresses them; you are present at their fiercely honest self appraisals. And you meet the amazing Gerry Doyle: the film’s title is a statement of his approach to every game-‘In my book you should be ahead’. He is their veteran manager. He talks about football and its tactical truths with the excitement of a Newton or an Einstein on the brink of a great discovery. Posted by WorldbyStorm in Economy, Irish Politics, The Left, US Politics. There’s an excellent point, made about US politics, but entirely applicable to our own, here. Dave Weigel of Slate.com writes about the [predictable] failure of the third party candidate movement, Americans Elect. AE decided to establish a process to nominate a bipartisan candidate who would draw independent support and build on what they hope is a centrist but unarticulated majority (or significant minority). But as Weigel notes that latter is arguably entirely illusory. Though not necessarily for the reasons Weigel argues. He suggests that there is no centre, that people are more partisan than they claim in polls. Very likely, up to a point. But I’d go a bit further. Look at the Democratic and Republican platforms in 2012 and compare and contrast with the 1980s or earlier and it seems fairly clear that the centre of gravity of US politics has shifted rightwards. If that is the case then Obama is the ‘centrist’ candidate, for what that is worth. Sometimes a wealthy person says something that makes you wonder how people ever trusted him with money. Obama had “control” of the Senate—the 60 votes needed to beat a filibuster—from September 2009 to January 2010. If you don’t realize how the delayed seating of Al Franken or the illness of Ted Kennedy or the victory of Scott Brown changed things, you don’t know how the government works. You don’t break the power of the parties by running in a presidential election. You start with Congress. That’s what the conservative movement has done over 20-odd years, making it untenable to face primary voters if you cast moderate votes. And there you have it. There’s far far too much emphasis, both in US politics and our own on personality (and in the US on Presidential politics). It’s not that it doesn’t matter. It certainly does, not least in terms of tone. But the long term effectiveness of a political project is built on much more banal and everyday work at representational levels. And that requires concentration on Congress etc. One of the most striking aspects of US politics recently has been how the Gingrich wave of the early 1990s was, at this remove, simply not radical (radical right) enough for the Tea Party, with one after another of that intake falling to harder-line TP candidates. Of course, by 1990s standards those original reps were well to the right of their predecessors (and it’s telling how even staunch Reaganites elected before the Gingrich crew have also been insufficiently right wing for the TP). But it was those successive waves of candidates who were elected who pushed the needle to the right. Perhaps in some sunnier time ahead there will be movement in the other direction – perhaps if (and it remains an if) the Democrats win the next Presidential election and if the Republican vote is in some way diminished this may institute a rethink – though I’d be very doubtful, it seems to me the TP needs to burn out over time. But to be honest I suspect that the next wave within the Republican party will be even more right wing again. Anyway, Weigel continues, why not take the $35 million that Americans Elect raised and go after House seats? Why not? Because that’s hard work, it requires dedication and focus across not the year or so of a Presidential campaign, but the four, eight and twelve years that precede House elections. And hard work requires an organisational structure (however diffuse or coherent) and that requires something more than good wishes and good intentions. And realistically it isn’t going to happen – one need only look at the way the Reform party, which catapulted Ross Perot to the closest run third party candidate in modern times, again back in the 1990s, swung between centre/populism and fairly hard right positions, to see that there’s no guarantee that a third party, adopting centre positions will function as its founders intend. Now a party to the left of the Democrats? Again, it would take years, decades, perhaps more. One would be looking at something not unlike the journey of the NDP in Canada, and with no guarantee of success. But if you’re in this to gain state power at state or federal level then the only way is to look at the conservative movement, and start small building big. Interestingly this is the very model which we’ve seen adopted in our own state by parts of the left of Labour. And it has worked to some degree, though it would be a brave woman or man who suggested that the SP or even SF is close to state power or that there’s an absolute inevitability as to that outcome. But as always it simply points to the fact that the only way for movements to win is to work on the ground. As true for left as right. Posted by WorldbyStorm in Economy, The Left. The claim involves 86 of 3,400 workers in the files of the Consulting Association, a covert organisation paid by big names in the industry to collect damaging information on workers regarded as leftwing or troublesome. The files included information about trade union membership, relationships, friendships and political views, along with surveillance intelligence. The Information Commissioner’s Office said at Smith’s tribunal that it believed some of the information held by the covert organisation and accessible to companies that subscribed to the service “could only have been supplied by the police or the security services”. It is this that underlines the point – albeit in the starkest possible way – that employments are far from neutral environments where capital and labour can operate in harmony, but instead are shaped and dictated by the former to their own ends. I’ve asked the question before but it is worth reiterating. Imagine for a moment a left wing or labour organisation that sought to do what the Information Commissioner’s Office has said the CA has done. What would the stance of the security services be on that. The idea that police or security services would supply information to such an entity is laughable. The Consulting Association, a clandestine organisation funded by major names in the construction industry, was run by Ian Kerr for more than 30 years. Its database was seized nearly three years ago, but the extraordinary nature of the information it held only fully emerged following a recent employment tribunal for one of the victims, Dave Smith, 46, an engineer who had a 36-page file against his name and was repeatedly victimised for highlighting safety hazards on sites, including the presence of asbestos. That latter is a clear public interest issue. But then it is all a public interest issue. Many thanks, by the way, to Jim Monaghan for alerting me to this follow up. Posted by WorldbyStorm in Communist Party (Northern Ireland), Irish Left Online Document Archive. To download the above file please click on the following link: PROSPEROUSCPNI45? This document is perhaps the oldest one in the Archive, dating back to the Second World War period. 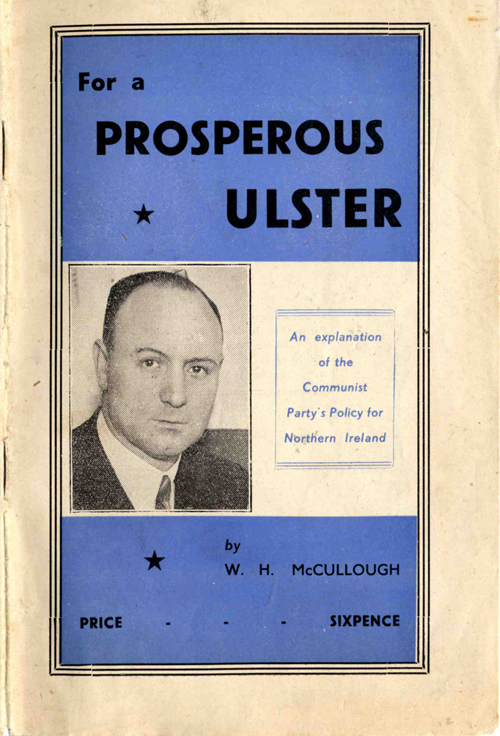 It was issued by the Communist Party of Northern Ireland. The CPNI emerged from the suspension of the Communist Party of Ireland in 1941 (an event which ultimately led to the eventual emergence of two CP formations on the island, the Irish Workers Party in the South in 1948 and the CPNI in the North). This state of affairs was not to be altered until the merger of the two parties as the CPOI in 1970. The document itself is slightly smaller than A5 and sixteen pages long, it was written with the end of the war in sight. Therefore it notes that ‘Future prospects are bright. Victory is in sight but it is not yet won’. Stalin’s wise declaration that a wounded beast can be very dangerous is a timely reminder that all is not over; the beast has to be followed into its lair and destroyed. After Germany Japan will have to be dealt with. The people have learned innumerable lessons from the war. They have been inspired by the glorious achievements of the mighty Socialist Power, the Soviet Union. They have seen that when united internally and with the peoples of countries inspired by the same ideals of freedom and democracy against a common enemy and for a common cause, the dark forces of fascism can be conquered. The value of the cooperative effort has manifested itself to millions as a new power in society, even though at times co-operative effort was restricted and limited by a section of reactionary employers. In Northern Ireland also there will be great work of reconstruction. Bombed areas must be rebuilt. Houses will have to be constructed on modern lines, providing the greatest possible opportunities for the people living in them to lead a healthy life. The greatest obstacle to the unity of the people and the full mobilisation of the resources of NI is the Unionist Party. The Government has made no effort to unite the people, and the war effort of the Province left much tone desired. The anger of the people eventually drove Andrews and his gang out of office, a new Unionist Party Government was formed under the leadership of Sir Basil Brooke and pledged to conduct a policy for the utmost prosecution of the war. There is some interesting material on the ‘Imperial Contribution’, the funding given to NI by the British Treasury. There is also a strong focus on industrialisation and on the prospects for industrial growth in relation to shipbuilding, engineering, aircraft and linen. It argues in relation to these and other areas that ‘it is obvious that a considerable amount of capital expenditure will be required and complete re-organisation must take place’. It also argues for Social Insurance, modelled on the Beveridge Plan, Health Services and Education. In relation to the last it proposes that ‘dual control be abolished; religious instruction to be at the option of the parents, and teachers have the right to teach religion or not, according to their wishes and conscience’. In fighting for this programme for the people, labour must ensure that the people obtain every opportunity to exercise their democratic rights. Labour must ensure that at the earliest opportunity undemocratic legislation, such as the Special Powers Act, is removed from the statute book; that undemocratic actions such as the gerrymandering of constituencies and sectarian discrimination against a section of the people is ended. The labour movement must demand that all those elected to represent the people carry out their responsibilities. There must be an end to Parliamentary absenteeism and the virtual disenfranchisement of many electors through the abstentionist policy of a section of Nationalist members of Parliament. But in terms of the island as a whole it seeks ‘a Government that will be a good neighbour of the Government of Southern Ireland’. Overall an useful guide to the orientation of the Communist Party in Northern Ireland during this period. Posted by WorldbyStorm in Culture, Economy, Irish Politics, Sinn Féin, The Left. Interesting editorial in the above which makes a link between the Hunger Strikes and our current predicament. Available from usual stockists, here’s what’s in the issue. 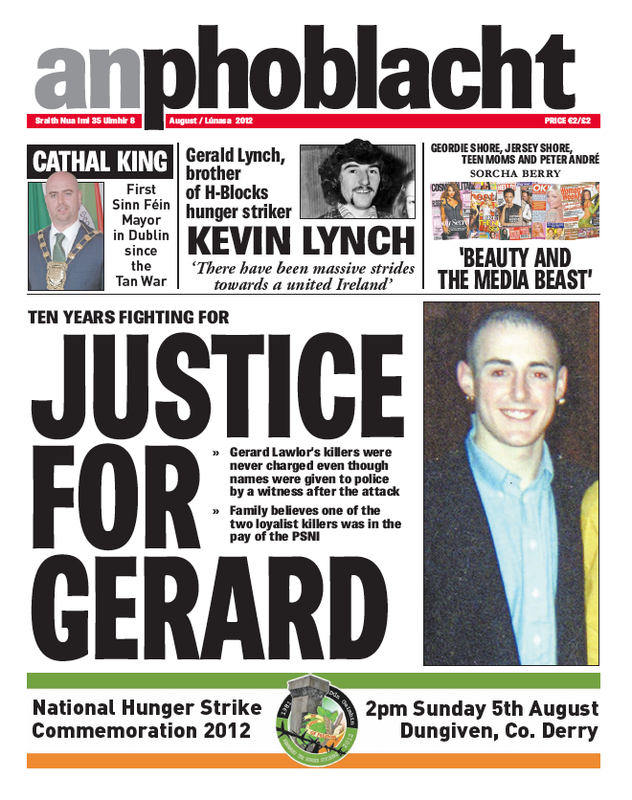 ON THE EVE of the National Hunger Strike Commemoration in Dungiven, County Derry (2pm Sunday 5th August), An Phoblacht talks to the brother of H-Blocks Hunger Strike martyr Kevin Lynch from Dungiven. Gerald Lynch talks about growing up with Kevin, the effect Bloody Sunday had on them, and how proud the family is of Kevin, standing by him after failing to persuade him not to embark on the 1981 Hunger Strike. Writing in An Phoblacht for the first time since Martin McGuinness’s meeting with Queen Elizabeth, Sinn Féin National Chairperson Declan Kearney says the event “made a big statement about the need for more change, greater imagination, courage, and really big thinking to bring that about . . . from everyone” – including unionists leaders. Fianna Éireann member 18-year-old Tobias Molloy, shot dead by British soldiers at the infamous Camel’s Hump checkpoint on the Strabane/Lifford border in 1972, is remembered in a full-page commemoration report, as are Síle Fleming of Derry City and Joe D’Arcy of Galway in obituaries. Ciarán Mac Airt reports from the Community Inquiry into the 2002 murder of north Belfast teenager Gerard Lawlor and his family’s ten-year fight for ‘Justice for Gerard’. Marking another breakthrough for Sinn Féin, An Phoblacht interviews the new Mayor of South Dublin, Cathal King – the first Sinn Féin Mayor in Dublin since the Tan War. Tierna Cunningham, the new Sinn Féin Deputy Mayor of Belfast, talks to Peadar Whelan about how she joined Sinn Féin at the time of the unionist siege of Holy Cross Primary School a decade ago, and what an inspiration the late Marie Moore has been to Tierna. Peadar Whelan reports from The Twelfth and the ‘Orange Order’s conflicting ways’, including the peaceful progress in Crumlin where the Orangemen held talks with their neighbours, and the conflict in Ardoyne where the Orangemen didn’t. Ahead of September’s anniversary of the Ulster Covenant, Tom Hartley explains the history of the Westminster Tory/Unionist alliance behind the Covenant and how the signing was ‘Underlining Partition’. In sporting (or unsporting) matters, Matt Treacy catches up with some Olympics cheats and Ciarán Kearney gives Cavan defector Seánie Johnston a rap over his move to Kildare in ‘Hurlers Who Can Stick It Out’. Eoin Ó Murchú finds the Fine Gael/Labour Government’s ‘jobs stimulus’ not very stimulating at all, and Eoghan Mac Cormaic goes surfing to show how social media being used by former Belfast Mayor Niall Ó Donnghaile and newly-elected Clonakilty Mayor Cionnaith Ó Súilleabhain are using Twitter and Facebook to keep people informed with real-time information. 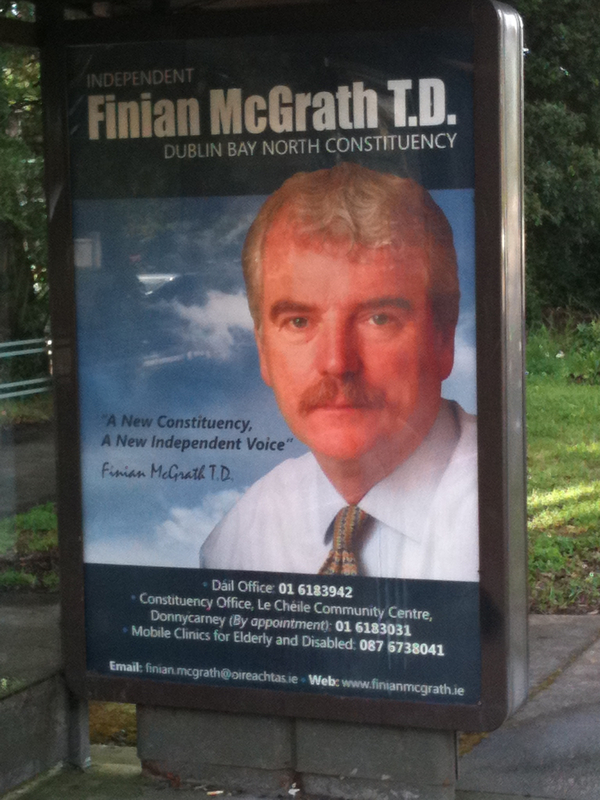 Dublin City Councillor Mícheál Mac Donncha is ‘Remembering the Past’ and 1972, ‘A Summer of Tragedy’. And the past in IRA legend Tom Barry’s ‘Guerilla Days in Ireland’ is being brought to life in a theatre tour previewed by An Phoblacht. Many of Ireland’s mega rich do have to pay big tax bills — but many more have shipped big losses from the bust which they can offset against gains. Jody Corcoran did make me laugh. Those two idealogues in Government, Leo Varadkar and Pat Rabbitte, last week chose that Official Ireland love-in, the MacGill Summer School, to sound off on the future of the media in a debate entitled ‘The Media and Democracy’. The idea Rabbitte is an ideologue is amusing. The idea that Varadkar is the only right-wing ideologue in the government is much less so.